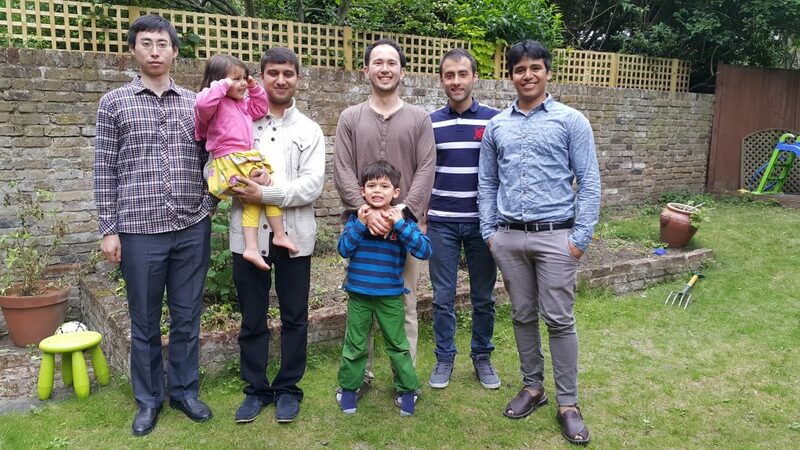 Left to right: Liang Yang, Aliya, Hassan Farooq, Khalid, Jassim, Peter Alizadeh, Deepak Singh Nagarkoti. Not present: Luwei Yang, Ahmed Khalid Aziz, Wanlin Li. Deepak has been investigating the primary challenges related to the use of non-Foster circuits for broadband matching of electrically small antennas. Non-Foster circuits are those in which the slope of the reactance is opposite to what is ‘natural’, i.e. the slope decreases, rather than increases with frequency. Effectively this means that one may have negative capacitors and inductors (and resistors), which has all sorts of interesting applications including small antenna matching, and for making extremely low voltage transistors. The primary challenges are the tendency towards instability, as well as the high noise levels. Deepak’s work has involved the characterisation of the fundamental performance limitations due to instability and noise, as well as development of experimental methodologies for measuring these. He is due to complete his PhD at the end of 2016. Emotions are expressed musically through various effects, including vibrato (a regular, pulsating change in pitch) and portamento (a slide in pitch from one note to another). It is important to understand the nature of these effects, both musically and mathematically. Luwei has been developing mathematical models and computational algorithms to quickly extract out relevant properties of these effects. This has been applied to a comparison between musical expression with Western (violins) and Eastern (erhu) instruments. It will also enable improved processing and musical reproduction capabilities. He is due to complete his PhD at the end of 2016. Recent improvements in III-V and BiCMOS technologies have enabled large-scale commercialisation of mm-Wave chipsets at low costs. A number of exciting applications are to be released to the market over the next 5-10 years, including WirelessHD and WiGig at 60 GHz, and the next generation of automotive radar at 70, 90, 100+ GHz. The ability to dynamically reconfigure mm-Wave systems is a requirement in many applications, or would at the very least significantly improve performance. At 60 GHz for example, atmospheric absorption is high and so a directive, steerable beam is important to maintain data transmission performance. Peter has been working on novel reconfigurability techniques, most recently through the optical excitation of semiconductors to tune charge carrier density. Essentially, this means that the conductivity across a layer of Silicon (for example) can be tuned with LEDs (or a projector) so that the shape and performance of an antenna can effectively been changed at will. He has demonstrated that he can both steer the beam, and even remove sidelobes (beams going in directions which they shouldn’t be). Peter has been working with me since his undergraduate degree. For his final-year project, he built a high altitude telemetry system; a helium balloon-mounted package that flew up to 23,000 m, took photos, video, and a range of sensors, and sent information back down to the ground. He has also built up a few other interesting projects, including a very low-cost (<£100) microwave radar system and Ka-band test bed). Ahmed has been hacking our terahertz time-domain spectroscopy (THz TDS) system to be able to measure spoof surface plasmon polaritons (SSPPs). These are essentially a sort of surface wave that can propagate a wide range of wave vectors along an interface. There has been much interest in these, primarily at optical frequencies but also at THz, as they may enable extremely sensitive sensing and improved communications capabilities. The THz gap has only recently been explored, primarily with the use of THz TDS to coherently measure transmission through a sample. To measure surface waves is a significant problem and requires extensive changes to the equipment, but would be invaluable in exploring SSPPs along 2D structures such as metasurfaces and graphene, and along interfaces such as the skin (for nano-network comms). In the form of radar technologies, microwaves have long been used for detecting locations and velocities of large objects. High resolution radars have incorporated very large arrays of very big antennas, which allow both high bandwidth and high directivity. Recently there has been interest in various localisation techniques for smaller-scale applications. An example could be a UAV (such as a small drone), which would have low weight capacity and restrictions on size. Traditional radars would clearly not be suitable. Hassan has been developing a novel technique of implementing a high resolution localisation array in a very small and compact package. We hope that this will prove to be extremely useful for drones, and other compact applications.